“AR Health Simulation.” James Madison University. Mike Miriello. January 28, 2019. “Suitcase Clinic Gets Boost From JMU X-Labs.” Public Radio. Bridget Manley. WMRA. December 5, 2018. “JMU students propose idea to better help homeless population.” Local News. Bob Grebe. WHSV TV-3. Harrisonburg, VA. December 5, 2018. “Opioid Treatment Grant.” Student News. Anna Saunders and Peyton Kennedy. Breeze TV. October 5, 2018. “JMU X-Labs wins second consecutive Governor’s Technology Award.” Student News. Chelsea Church and Eric Bartlett. Breeze TV. September 20, 2018. “JMU X-Labs take[s] home award second year in a row.” Local News. Bob Grebe. WHSV TV-3. Harrisonburg, VA. September 10, 2018. “As graduation looms, students prepare to leave JMU X-Labs.” Local News. Marina Barnett. WHSV TV-3. Harrisonburg, VA. May 3, 2018. “JMU X-Lab[s] Students Graduate.” Local News. John Rodgers. WHSV TV-3. Harrisonburg, VA. May 3, 2018. “Virtual tours and a self-driving golf cart: JMU students unveil tech projects.” Local News. Mackenzie Lee, Bob Corso and Nina Baratti. WHSV TV-3. Harrisonburg, VA. April 27, 2018. “JMU X-Labs hosted its first drone quidditch tournament.” Student News. Breeze TV. April 19, 2018. “Fueled Feast event debuts new ‘Farmbot’ on JMU’s campus.” Local News.Mackenzie Lee and Morgan Donnelly. WHSV TV-3. Harrisonburg, VA. April 18, 2018. “JMU students hack for American security.” Local News. Kyle Midura. WHSV TV-3. March 16, 2018. “Fab Lab at JMU.” Local News. Bob Corso. WHSV TV-3. Harrisonburg, VA. January 29, 2018. Television. “JMU event aims to raise STEM interest in women.” Local News. Johnny Oliver and Bob Corso. WHSV TV-3. Harrisonburg, VA. January 29, 2018. “[JMU] X-Labs to Industry.” Harrisonburg Rockingham Chamber Connections. WVPT Public Media. January 17, 2018. “BrightLink Pro Interactive Displays Support Student Collaboration at JMU X-Labs.” Case study sponsored by Epson. 2019. “JMU students invited to present class project at NATO meeting in Croatia.” Augusta Free Press. Eric Gorton. March 24, 2019. “NATO invites students to present project.” JMU News. Eric Gorton. March 22, 2019. “JMU incorporates virtual reality across campus through [JMU] X-Labs.” The Breeze. Matthew Sasser. March 22, 2019. “JMU students to test skills developing special ops equipment at Fort Bragg.” Augusta Free Press. Eric Gorton. March 1, 2019. “JMU students invited to intelligence hackathon.” JMU News. Eric Gorton. February 27, 2019. “Students to present at premier IT conference.” JMU News. Eric Gorton. February 18, 2019. “A Model for Project-Based, Interdisciplinary Learning.” The Teaching Center. Emily Wasserman. Washington University in St. Louis. February 12, 2019. “No Textbooks, No Lectures, and No Right Answers. Is This What Higher Education Needs?” The Chronicle of Higher Education. Beth McMurtrie. February 10, 2019. “JMU first university to partner with BRMi for robotics course.” The Breeze. Mitchell Sasser. January 31, 2019. “Scope of Practice.” JMU News. Hannah Long. January 30, 2019. “JMU X-Labs – Bridging the gap between curriculum and industry.” JMU News. Kimberly A. Fisher. January 29, 2019. 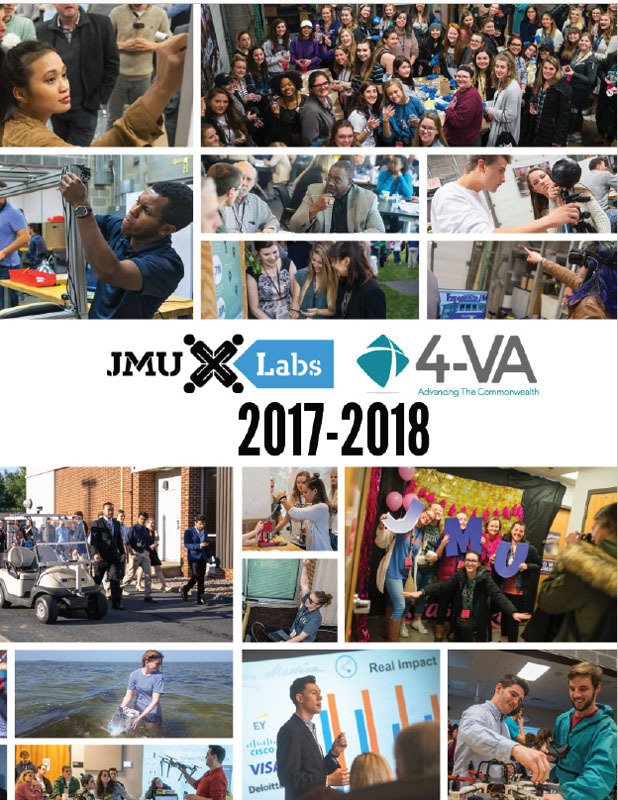 “JMU X-Labs: My Experience.” Her Campus at James Madison. Olivia McCoy. January 28, 2019. “The MBA students helping to solve national security problems.” Financial Times. Jonathan Moules. January 27, 2019. “BRMi to Teach Robotic Process Automation at JMU: JMU X-Labs breaks new ground in pioneering new technology trend.” PR Newswire. BRMi. January 17, 2019. “Staunton Innovation Hub sees potential for economic growth through mobile tech.” Staunton News Leader. Rilyn Eischens. December 27, 2018. “Discussion on significant experiences.” Technological University of Bolívar. December 7, 2018. “Augmented reality, internet of things in showcase.” JMU News. Eric Gorton. December 5, 2018. “Student innovation aids nonprofits.” JMU News. Eric Gorton. November 30, 2018. “Stop Blaming Innovation.” (Correspondence from Chronicle readers). The Chronicle of Higher Education. Benjamin S. Selznick, Matthew J. Mayhew, Nick Swayne. November 20, 2018. “Students Build Bee Homes to Support Pollinators.” Lancaster Farming. Vic Bradshaw. November 2, 2018. “Is this JMU program the future of education?” eCampus News. Dennis Pierce. September 26th, 2018. “‘Hacking For Defense’ course to be taught in 20 universities this year.” EdScoop. Ryan Johnston. September 21, 2018. “Hard work pays off for JMU students and faculty: Autonomous Vehicle Class wins the 2018 Governor’s Technology Award.” JMU News. Caleb Ayers. September 10, 2018. “JMU X-Labs Wins Award.” Daily News-Record. Megan Williams. September 10, 2018. “JMU X-Labs, student solutions to real problems.” The Observatory of Educational Innovation. Christian Guijosa. July 23, 2018. “All Atwitter About Drones.” The Smithsonian Conservation Biology Institute. Amy Johnson. July 20, 2018. “University Course Helps ‘Build the Bench’ of Future Government Leaders.” U.S. Army. Ellen Crown. June 26, 2018. “Hacking for Diplomacy: Students bring fresh perspective to ‘wicked’ problems facing government and industry.” Madison Magazine. Kimberly A. Fisher. p. 34-35. April 24, 2018. Published in JMU News on May 23, 2018. “X Marks the Spot: JMU X-Labs Innovation Summit Showcases Technology.” Daily News-Record. Kelly Clark. April 27, 2018. “Fueled hosts local food takeover at E-Hall.” The Breeze. Andrea Brusig. April 16, 2018. “X Marks The Spot: JMU X-Labs Pop-Up Classes Enhance The Learning Experience.” Daily News-Record. Justin McIlwee. April 14, 2018. “JMU X-Labs: Quad brick engraving workshop.” The Breeze. News desk. April 13, 2018. “Pop-Ups Offer Classes on Today’s Hot Topics.” New York Times. Abby Ellin. April 5, 2018. “Finding Solutions for the Department of Defense.” JMU News. Stephen Briggs. March 30, 2018. “Colleges Have Spent Big Money on Innovation Centers. Do They Work?” The Chronicle of Higher Education. Julian Wyllie. March 30, 2018. “How to Help University Developers Envision a Campus Innovation Center.” Arista. February 13, 2018. “JMU X-Labs hosts event aimed to increase female involvement.” The Breeze. Thomas Robertson. January 30, 2018. “Fab Lab.” Daily News-Record. Stephen Swofford. January 29, 2018. “JMU X-Labs contributes to student-created 3-D printer.” The Breeze. Jillian Lynch. January 5, 2018. “JMU student works toward building self-driving car.” The Breeze. Travis Valle. December 30, 2017. “Four Campus Resources You’re Not Using” The Daily Duke. Stephen Abramowitz. October 18, 2017. “Tech Council Offers [JMU] X-Lab[s] Tour, Fund Info.” Daily News-Record. Vic Bradshaw. October 11, 2017. “Governor Honors JMU X-Labs.” Daily News-Record. Nolan Stout. September 10, 2017. “JMU innovation earns high praise: [JMU] X-Labs a winner of Governor’s Technology Award.” JMU News. Eric Gorton. September 7, 2017. “Not just a better mousetrap: Engineering major’s 3-D printer will do more than print.” JMU News. Eric Gorton. July 28, 2017. “The College Course Where the Military Assigns the Homework.” Wired Magazine. Dan Raile. July, 26, 2017. “JMU Drone Project: Students Seek ‘Sweet Spot’ in Interdisciplinary Class.” JMU News. Jen Kulju. April 19, 2017. “Learning [at JMU] X-Labs.” The Breeze. Katelyn Merriman. March 16, 2017. “These college students invent things for the Pentagon, and maybe find a business.” The Washington Post. Aaron Gregg. February 19, 2017. “Student research takes flight with Virginia Drones Project.” Richmond Times-Dispatch. Karin Kapsidelis. December 27, 2016. “JMU students equipping drone to save historic wall in Colombia.” Augusta Free Press. November 30, 2016. “Students compete in Bluestone Hacks innovation competition.” The Breeze. Kate Abbott Hawkins. April 10, 2016. “The challenge of drones.” JMU News. Jan Gillis. February 12, 2016. “JMU X-Labs offers ‘pop-up’ courses in glass blowing, 3-D printing.” The Breeze. Morgan Lynch. January 20, 2016. “Drones, pop-up classes and more: Fall 2015 innovation update.” JMU News. Eric Gorton. December 16, 2015. “Students equip drones to tackle local, global issues.” JMU News. Jen Kulju. December 4, 2015. “WRTC 486 ‘Writing in the Community’ Takes to the Air.” WRTC News. James Madison University. Lindsey Campbell. December 1, 2015. “University Innovation Fellows plan to spread entrepreneurship across JMU.” JMU News. April 24, 2015. “Bluestone Hacks event invites innovative students to fix real issues.” The Breeze. Morgan Lynch. April 15, 2015. “How a JMU Physics Lab is Improving Higher Ed Efficiency.” JMU News. Josh Kelly. March 23, 2015.